Post your questions here for Bryan Kennedy. We'll pick the best ones and post his answers. ryan Kennedy, an exhibit developer at the Science Museum, is sailing around the Pacific Ocean with the Joint Oceanographic Institute's "School of Rock" to learn how scientists explore the Earth under the sea. The Joint Oceanographic Institute (JOI) is part of the Integrated Ocean Drilling Program—an international partnership that uses large drilling ships to study the Earth's oceanic crust. The JOI program was one of the first groups to confirm that a giant meteor struck the Earth 65 million years ago in the Gulf of Mexico, possibly killing off the dinosaurs. 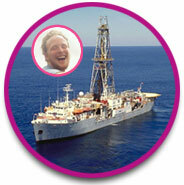 Why study the geology of the sea floor? To answer questions about how the Earth formed and continues to change, geologists and other scientists study the rocks from volcanoes, earthquake zones—even places in the middle of continents, such as Minnesota. However, since most of the Earth is covered by water, we can easily study only about a quarter of the planet's surface. Imagine solving a complex jigsaw puzzle while only looking at a quarter of the picture. Tough, huh? To get more information, scientists use giant drillships to collect and study rocks under the oceans that cover three-fourths of the Earth's surface. Kennedy will meet some of these scientists to learn how this works. "To find out how you study the Earth under the sea floor, I'm floating around the Pacific Ocean for 16 days with a team of teachers and expert scientists. I'll be reporting back live, answering your questions and telling you about our adventure." So what have they found? The rocks on the ocean floor trap information about past climates, helping us to understand how our weather might change in the future. Ever use a compass? A compass should always point north, to the Earth's pole. But rocks on the sea floor tell scientists that the Earth's magnetic poles have flipped many times during geologic history. In 1997, the JOIDES Resolution found evidence that a giant meteor crashed into the Earth off the coast of the Gulf of Mexico 65 million years ago. Many paleontologists think the impact caused the dinosaur extinction.